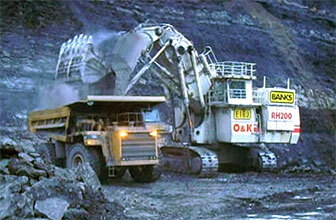 A Power shovel Terex O&K RH200 Loading Haul Trucks - Video. Elearning. Video Description: Terex O&K RH200 Eating its way through the Northumbria Country side. Loading Caterpillar 785-789 Haul trucks. Source: PatriotBNP. A Power shovel (also stripping shovel or Front Shovel or Electric Mining Shovel) is a bucket equipped machine, usually electrically powered, used for digging and loading earth or fragmented rock, and mineral extraction. Terex Corporation is a diversified global manufacturer of a broad range of heavy equipment for a variety of industries, including construction, infrastructure, quarrying, recycling, surface mining, shipping, transportation, refining, utility and maintenance. The company's major business segments include aerial work platforms, construction, cranes, materials processing & mining, and road building and utility products. Source: Wikipedia, Terex.